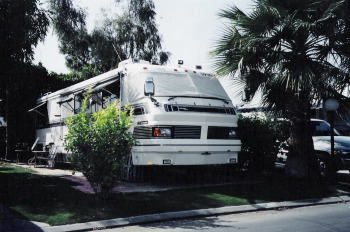 We have 12 years and counting,experience in Living in an RV and recommended it as a wonderful way of life...it's also a inexpensive way to retire. It is now our summer escape from the Phoenix heat...we head to Sunriver Oregon...and I get out my fly rods...tow my 1996 13 foot aluminum boat to my favorite lake and spend 4 days a week doing battle with the wily trout...we lease a space for a year, need somewhere to keep my boat...and are now in our fourth year of living in ab rv...its 25 years old and is very comfortable. The couple across from us in Oregon are "fulltimers" Yuma, AZ in the winter...Oregon in the summer...funny they always have lots of family visit them in the summertime. If living aboard a sailboat is not for you, this is something you should consider...you won't get seasick that's for sure. 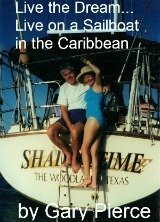 This is also a lifestyle that you can do in your 80s, not so with sailboat cruising, living in an RV is a lot less strenuous... And still a lot of fun. We did both, but realize it is not for everyone. So if staying on firm ground is more for you, and want to experience the freedom of living in an RV and living cheaply, we can show you how. After 2 years of living aboard a sailboat, we had convinced ourselves that living in a small space was very doable and very enjoyable. The frugal living lifestyle was really making sense and we did not feel deprived in the least.We thought RV living would be a wonderful way to spend the summer, seeing the great USA. It is a wonderful thing to not be constantly unpacking and packing. You have everything you need to live, and live comfortably with a steering wheel in your living room of your home on 6 wheels. No,we were not in witness protection, we were just mobile at all times. We are now RV owners again... in 2015we bought an exact copy of the RV we owned previously and sold in 2005. But since the same model is now 25 years old, we paid a lot less. when we bought it it had 153,000 miles on it...with an engine rebuild at 137,000 miles...do not ask me why it was rebuilt since these babies, a 2 cycle Detroit Diesel V692, can go several hundred thousand miles in a semi before a rebuild. The exterior is a little tired, but we bought it for the beautiful woodwork inside and the mechanical reliability and craftmanship that goes into a Foretravel. With help from a good friend, we replaced the carpet with Pergo floors and removed the sofa for a little extra space,we absolutely love it and spend our summers in Sunriver, Oregon...we have leased a spot for the year that allows me to leave my aluminum fishing boat when we return to AZ. When we discovered that a sailboat was really a floating RV... being fully self-contained... we realize the reverse would be true, and that RV retirement would be a perfect supplement to our mobile nautical retirement lifestyle. We started looking at RVs, after two years on the boat. We looked all over the country, I mean from Florida to Oregon, for 2 summers. We are big believers in doing your homework before taking the plunge with any big decision. In October 1998 we purchased a 40' 1992 Foretravel. RV living, why did we pick a 40 footer? Now I know what you're thinking, we went from a big home to a 35 foot sailboat... and thought we could get by with a smaller RV... instead we bought what at the time was considered a large RV... a 40 footer. Compared to the boat with curved walls, the RV had about three times as much living space... Why?... we just liked the way the 40 footer felt...we could've enjoyed RV retirement with a travel trailer and we would've seen the same scenery... it's just a matter of personal preference. Thanks for reading living in an rv...a great retirement lifestyle.